WASHINGTON—The 2019 SEGD Conference Experience Austin is poised to bring three inspirational days of experiential graphic design programming to the local and international community in the "Lone Star State" June 6–8. "The annual SEGD Conference is really the gathering of the EGD clan," says Clive Roux, SEGD CEO. "Besides the amazing lineup of speakers, the real reason you should attend is for all the activities aimed at connecting you to the community: From the Academic and Young Designer Summits to the networking functions such as the opening party, presidents party, auction and Global Design Awards evening, SEGD has got you covered." Prior to the conference, on Wednesday, June 5, University of Texas at Austin, School of Design and Creative Technology will host the annual SEGD Academic & Research Summit, where design educators, researchers, students and practitioners will gather to hear presentations from original peer-reviewed design and user research related to experiential graphic design. "With a conservative prediction of over 600 EGD professionals—from seasoned experts to emerging students—SEGD’s conference is the most comprehensive gathering of experiential graphic designers in the world," says Chris Wojcik, SEGD's chief of professional learning and business development. "This year, we’re lucky to be in Austin—the creative capital of Texas—for three days packed with empowering sessions, professional networking and inspirational guided tours." This annual SEGD gathering is the only conference specifically created for the experiential graphic design community—experiential and environmental graphic designers, architects, landscape architects, interaction designers, branding and strategy experts, technology integrators, fabricators, makers and clients involved in the design of place and experience. The three-day event focuses on inspiration and education, with a potent and fun combination of hands-on workshops and charrettes, design tours, summits, networking socials, thought leadership sessions and even an expo floor with technical skills talks, called NEXPO. In Austin, the conference will engage participants on a range of topics from design thinking and understanding experiences to leadership transitions and ADA/Accessibility updates. Speakers will include design legends like Paula Scher of Pentagram, alongside presenters from leading firms including Gensler, Entro, fd2s and C&G Partners in addition to local institutions like the School of Design and Creative Technology, University of Texas at Austin. Project tours on Thursday, June 6, will show participants a unique design-oriented view of Austin destinations like the East Side Arts District, Oracle Campus, IBM Design Center and Austin Central Library. On June 8, the SEGD community will send off the conference, celebrating excellence in experiential graphic design by saluting the winners of the prestigious 2019 SEGD Global Design Awards and 2019 SEGD Achievement Awards—including the 2019 Fellow Award recipient, who will be revealed at the event. 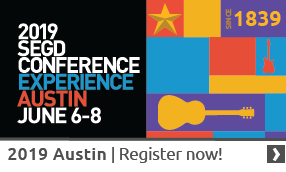 The 2019 SEGD Conference Experience Austin will be headquartered at the Fairmont Austin Hotel at 101 Red River Street, Austin, Texas 78701.